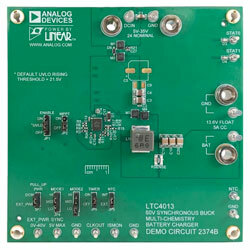 Analog Devices DC2374B Demo Board is intended to quickly and easily demonstrate the LTC4013 Battery Charger. The charger is a 60V Synchronous Buck Multi-Chemistry Battery Charger with a two-stage CC/CV charge cycles, three and four stage lead acid and Li-Ion battery algorithms. The Demo Board is set up to run from a 21.5V to 35V supply or from a solar panel and can charge a six-cell lead-acid battery at 5A.